COLD BREW LOVERS - LET'S MAKE THIS THE ULTIMATE COLD BREW THREAD. I first experienced cold drip from a home made cold dripper - WOW - a mouthful of ripened fruit, velvety chocolate and honey. I have a morning espresso or pourover, then cold drip sees me through the rest of the day. One of the great benefits of cold brew is that you can pack a flask of it and take it anywhere. ....and I do that. I take it everywhere !!! Here's my Cafe Romeo Juliet Tears with the ice water loaded. GreenBeanGenii and SpiceBean like this. gonzo89 and diode123 like this. Just wondering what is the difference between the coffee made by this cold drip and Toddy cold brew method? I believe that the Toddy system is more of an immersion method (i.e. and water are mixed in a sort of slurry similar to a plunger before dripping through), than Cold Drip which slowly drips the water through a column of grounds. Great question. One benefit of cold drip compared with cold steep is that cold drip can give you a much stronger concentrate. You can get something with a similar punch to an espresso, but with a completely different flavour profile and very low acidity. Cold steep can also yield a concentrate. I get the same amount of liquid from my cold steep as brewing the same mass of beans as espresso yields. The cold drip coffee I've had has been, on aggregate, quite sweeter. But that could just be the people/places that I've been to, rather than the method. Thanks to CS I searched cold drip and made a DIY version with my aeropress. Made 3 batches now and am hooked, love it! Love the different flavours you get from cold drip over espresso! Worth a trial at home! Living in Qld is gets a bit hot for hot coffee in January and Feb so looking forward to this as a great option! I live in a hot climate, and ice is going to melt fairly quickly. Will cold drip in the fridge yield the same results (taste) as ice? I don't think the water has to be iced for cold drip, just room temp will be OK, then chill to serve. That commercial set up is identical to mine at work! Plus 2x 3L Hairo towers. Exhausting to put on. It's the next big thing in coffee. BangalowBarista and NickC like this. How many drips per sec/min? I aim for 1 drip per 1.5 seconds... I use water with ice cubes. No need at all to keep the process in the fridge..
Nice, I keep mine at 1 drip per 1 second so im a little paced up! Here's mine! I set my drip rate at 30dpm (drips per minute) using a metronome. I've found that using too much ice is more annoying than worth, as the drip needs constant adjustment as the ambient temperature of the water changes. Cold filtered water to start, and then I'll top up some ice about 2-3 hrs in. I've got a lightly roasted single origin Columbian that I'm using at the moment. It's quite nice! I bought one last summer and find its a great (and cheap) way to make up a batch of cold coffee to take anywhere! I have a jug like that, but it's used to make iced tea. What is your preferred method for coffee with that one? 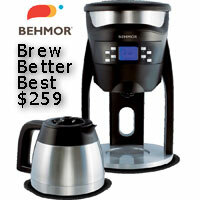 Using different temperature waters will yield a different result in the cup. As will putting the entire brewer in the fridge as it keeps the grounds cold throughout the brewing process. I have the Hario jug also and use it when I haven't got much time, put it in the fridge before work and it's done when I get home. I also use it for brewing cascara. On weekends I use my Coldbruer, which is a bit more hands on you have to adjust the drip rate fairly regularly. In the warmer weather we always have a cold alternative for the morning hit. What ratio of water/coffee do you use in this 1L Hario pot? I use a French press. The ratio of water/coffee is 5/1, leave it in a fridge for 12h+, then use aeropress for filtering. Usually I get about 50g concentrate for 15g coffee grounds. For my cold drip I get 550ml of strong concentrate from 80g of coffee. For my cold press I get 4.1l per kg of beans. That would be 328ml of concentrate from 80g of beans. One can indeed get a very nice concentrate from Cold Press/steep. Indeed it is! And that's using the standard ratio of beans to water for soaking. It's easy to remove 20% of the water for an even stronger concentration. I think Java what Java is suggesting is adding 20% less water than he uses in his standard brew. Hot off the press. Here's my little cold drip art video. But yes, you can get the stronger concentration by using up to 20% less water or 20% more beans. The same thing can not be done with cold drip brews. Well, been lurking here for days, with the weather warming up and thoughts turning to cooling concoctions, you lot have finally piqued my interest, as I type this I have a batch steeping in the kitchen, ratio approx 4.1, will report back after sampling tomorrow. How did you go Yelta with your cold drip?? How was it?? Tried a glass with ice cubes yesterday PM, I agree, it is a very clean, cool and refreshing drink, but then so is a glass of cold water, nothing really objectionable about it, on the other hand nothing remarkable either. On first impressions I feel it lacks what I'm looking for in a morning or afternoon brew, i.e. intensity/complexity of flavour, viscosity and mouth feel, I'm sort of left wondering when and why would I drink it? I guess the answer may be that if I had to make a comparison it would be to liken it to syphon coffee, I abandoned that after finding it simply not suited to my palate. Not giving up on it, I have more of the brew left so will try again this afternoon (forecast 35°C) here today, will report back again later. PS I wonder if these lighter more refined brews are better suited to younger palates that have not been bombarded with decades of intense flavours? Last edited by Yelta; 20th October 2014 at 09:45 AM. Try it with a darker, spicier bean/blend and go for the strongest concentration you can get. Your favorite espresso bean/blend would likely work well. And again. Make as strong a concentration as you can. Was this cold drip or cold press? I personally find cold press bland and boring but a cold drip can be a little more acidic but a lot more flavoursome. It reminds me of when I brew a Syphon, forget about it for an hour and then try it. I personally find cold press bland and boring but a cold drip can be a little more acidic but a lot more flavoursome. It reminds me of when I brew a Syphon, forget about it for an hour and then try it. I have to agree with you MW, cold press is refreshing but does not offer any of the notes of the coffee itself. It just tastes like a sweet but slightly more bitter than acidic bland coffee. I like it, but I don't love it. Cold drip all the way On the note about the Siphon.. If its not the first time I am experimenting with a particular coffee I let it go cold. Call me crazy but I actually record what my siphons taste like at every 10degree interval.. The changes are beautiful below the 50 degrees celsius. Ok so I know I have a separate thread about this for those who are interested..but this is the Ultimate cold brew/cold drip thread so it belongs here too. This is the device I want to be holding in my own home. If any of you were at the Coffee in good spirits event the other night in Brisbane you might have seen the Brewover in action making a cascara moonshine. I got to play around with the device and I was blown away by the design. It is a 3 in 1 device to rival them all. It is a pourover, cold brew and cold drip device! The kickstarter campaign was launched only a few days after that night and I got onto backing the product straight away as there are various packages for different prices. The price is too good to be true for what the product is in terms of construction and materials plus being multifunctional. Check it out and keep cool CS'ers! This will certainly blow the lid off of my cold bruer. I'll even give it away on CS if I get my hands on this haha. What's the product called? I can't see your pic?